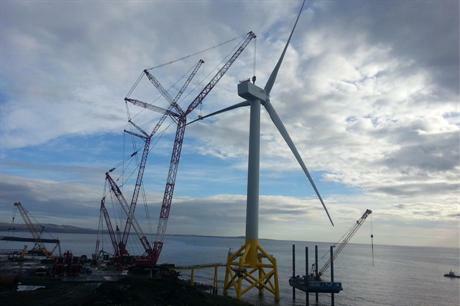 UK: The replacement of a damaged blade on the Samsung Heavy Industries 7MW offshore prototype has meant that its commissioning has been delayed until the end of March. A source within the company said that the blade had to be removed due to "small external damages" that were evident on its surface. Commissioning has already been pushed back, with Samsung telling Windpower Monthly in January that the turbine should be commissioned by early February. This constituted a delay on the original timescale, which would have seen the turbine generating power by the end of 2013. The blades are currently the longest in the world at 83.5 metres, providing a 171 metre rotor. Samsung originally announced the completion of construction in October at Energy Park Fife in Scotland. The nacelle was installed on 18 October, followed by the attachment of the three blades. One of these was later replaced. The company said: "We are pleased to confirm installation of the blades at our offshore prototype turbine is complete and people can now see the blades turning. Commissioning is in the final phase. We will then begin type testing for certification." The South Korean firm has invested £70 million (EUR 82 million) in the project and will have a 19-strong team to work on the testing programme over the next five years.